The Marquis de Lafayette Collections at Lafayette College, 1777 - (33 linear feet -- 96 boxes, 4 extra-oversize folders, 4 oversize shelves) contain a wide range of materials pertaining to the life of Marie Joseph Paul Yves Roch Gilbert Du Motier, the Marquis de Lafayette (1757-1834). Lafayette, a prominent participant in both the American and French Revolutions, was a symbol of liberty to many during and long after his lifetime. Consequently, these collections not only document the events in the life of a major historical figure; they also provide insight into the veneration both French and Americans have displayed for this champion of freedom in their democratic revolutions. Lafayette College houses one of the most distinguished collections relating to the Marquis de Lafayette in America. The materials are organized into three major categories: the manuscript, print, and memorabilia collections. The manuscript collection contains over 350 letters and documents, most of which are written in Lafayette's hand and/or hold his signature. These manuscript pieces date from his participation in the American Revolution in 1777 to his death in 1834. Many manuscripts relate to the French Revolution, as well as Lafayette's 1824-25 Farewell Tour of America. The print collection, containing close to one thousand 18th and 19th-century images, includes portraits, caricatures, symbolic compositions, views of Lafayette's homes in France, scenes from his life, and images of his family and associates from the American and French Revolutions. The memorabilia collection includes more than eight hundred pieces relating to Lafayette's life, many of which are commemorative objects dating from his 1824-25 tour. This extensive collection includes ceramics, glassware, metalware, textiles, personal accessories, commemorative medals and ribbons, weapons, broadsides and printed ephemera, sheet music, stamps, and newspapers. Besides these three major collections of Lafayette materials, the college also maintains a rare book collection on Lafayette, a collection of paintings and sculpture, and the records of the American Friends of Lafayette, a society founded in 1932 which is dedicated to the memory and study of the Marquis de Lafayette. Further information about these collections is available at the repository. A separate descriptive guide to the records of the American Friends of Lafayette in Skillman Library Special Collections is available as well. The Marquis de Lafayette Collections at Lafayette College have grown both in size and historical value since the early part of the 20th-century. The first major collection of Lafayette-related materials was purchased for the college in 1926 through the fund-raising efforts of the Lafayette College New York Alumni Association. This was the private collection of New Yorker Warren Cady Crane, mainly comprised of portrait engravings but also including 17 Lafayette manuscript letters. A portion of the Lafayette collections came to the college through the efforts of the American Friends of Lafayette. During the college's centennial in 1932, a group of avid Lafayette enthusiasts and scholars met at the college on May 20, the 98th anniversary of Lafayette's death. 52 people from the United States and France convened at the invitation of Lafayette College president William Mather Lewis. The result was the creation of the American Friends of Lafayette society, headed by Stuart Wells Jackson of Virginia and Judge Walter P. Gardner of New Jersey. As distinguished collectors of Lafayette materials themselves, these men encouraged the society's interest in collecting and preserving Lafayette-related memorabilia, manuscripts, prints, and books. Already the society's headquarters since 1932, Lafayette College became the official repository of the society's collection in 1940. During the 1940's, Lafayette College acquired some of its finest Lafayette materials. The collection of the Essex County Country Club of West Orange, New Jersey, came to the college in 1942. These materials, including approximately 100 prints and 20 manuscripts, were purchased for the college's collection by an anonymous benefactor. The following year, in 1943, Mrs. John Hubbard of New York presented the splendid collection of letters written by Lafayette to George Washington. Most of these 200-plus letters date from the American Revolution and are docketed in the hand of Washington. Certainly one of the college's most generous donors of Lafayette materials was Stuart Wells Jackson, a founder of the American Friends of Lafayette. In 1957, Jackson gave the part of his extensive private collection dealing with Lafayette's 1824-25 tour of America to Lafayette College. This gift of over 100 items contained many valuable broadsides, maps, and other pieces of historical printed ephemera. After Jackson's death later the same year, his estate presented the college library with a bequest which would become the bulk of the memorabilia collection. Provenance for the many items in the collections has been recorded in several ways. Each item in the memorabilia collection is stored with an individual memorabilia collection record. This information sheet records the donor, history, physical description, condition, and present location of the object. Two separate files containing photocopies of these memorabilia collection records as well as various other supplemental gift listings for materials in the manuscript and print collections have been created to provide further access to provenance information. Donor files have been arranged alphabetically by name. 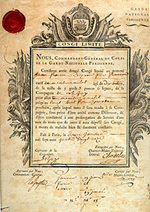 Under each donor's name, the following can be found: a copy of the memorabilia collection record for every item presented by a donor in the collection, listings of gift manuscripts, prints, broadsides, printed ephemera, and newspapers by donor, as well as complete listings of items received as a collection from a single donor. With regard to manuscripts, prints, broadsides, and printed ephemera, the donor's name, if known, has been recorded on individual items folders or on the reverse side of the item itself. Finally, the most complete files containing provenance information for the memorabilia collection is arranged by series classification. These files follow the same organization as the memorabilia collection inventory and are followed by files pertaining to the manuscript, print, and book collections at the end. Files contain photocopies of the memorabilia collection records as well as any other background materials providing additional historical information on each piece. Such background materials include descriptions or histories which were acquired with the item as well as related newspaper and journal articles. Throughout the 20th century, many purchases and gifts have continued to augment the Marquis de Lafayette Collections at Lafayette College. Besides the acquisition of large private collections over the years, many purchases and gifts to the collection have been made possible by the support of college alumni interested in preserving the memory of the Marquis de Lafayette and documenting his life history.